The rapid ageing of the EU has put emphasis on the need to extend working lives and has highlighted the importance of the employment and social situation of older people. Raising the employment rate of older people is of key importance to achieve the Europe 2020 employment target and to guarantee the sustainability and adequacy of pensions and more generally social protection systems. However, at the same time the situation of older people needs to be analysed from a social perspective to better identify which kind of challenges they face across the EU. The Chart below shows the employment rate of people aged 55-64 compared to that of the working age population (vertical axis) and the risk of poverty of people over 65 years old compared to that of the total population (horizontal axis). In all EU Member States the employment rate of older workers (aged 55-64) is lower compared to the overall working age population (20-64). As a result, all Member States are located in the Chart below the horizontal red line. 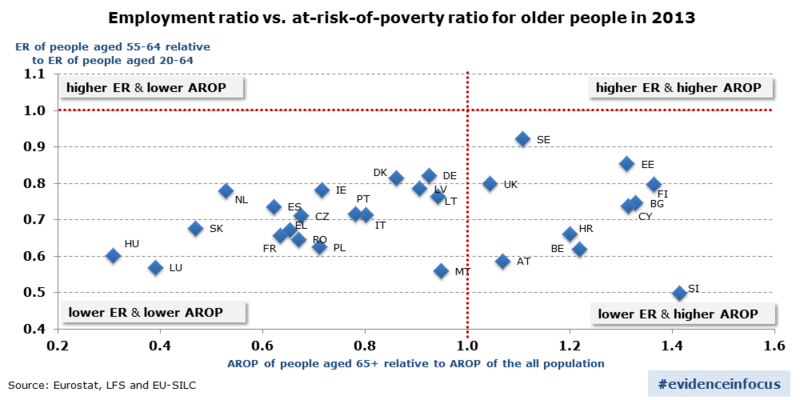 In most countries, the risk of poverty of elderly is lower compared to the rest of the population (countries on the left hand side of the vertical red line). This is largely an effect of the crisis which mainly affected the working age population, while the elderly continued to be protected by the pension systems (read also our previous post on old age poverty). Are countries with higher employment ratios of older workers also protecting their elderly relatively well from the risk of poverty? Interestingly, this is not the case across all Member States. As the chart shows, the relationship between older workers employment and old age poverty in EU Member States appears unclear and there are even outliers, which combine the two aspects in a counterintuitive way. For instance, Sweden and Estonia are the best performers in terms of relative employment situation of older workers compared to the working age population, but at the same time people aged 65 and over have a higher risk of poverty than the rest of the population. This may reflect cohort effects – as current pensioners may have shorter work histories than the current older workers; but also some weaknesses in the income provision for older people. At the extremes of the spectrum there are countries such as Hungary and Luxembourg that combine a very low relative employment ratio for older workers aged 55-64 with a very good relative income protection for older people above 65. Both the situations of countries with relatively high employment ratio and relatively inadequate income for retired (e.g. Sweden and Estonia), and Member States where pensioners seem well protected against poverty in comparison to the rest of the population, but where older workers' labour market participation is much lower than the working age population (e.g. Hungary and Luxembourg) are not ideal models. All in all, we see that EU Member States face different challenges in promoting simultaneously longer working lives and adequate incomes once retired. Why? There are multiple reasons for such a situation. They relate in particular to the skills situation of older workers and to demographic factors, but also to the design of pension systems and of policies promoting longer working lives. It should also be noted that the poverty situation of people aged 65 and more also reflects the work histories of older cohorts and how they are accounted for in current pension systems (in particular for women). To read more on policies that promote longer working lives, wait for our forthcoming Employment and Social Developments in Europe 2015 to be published in November. About income adequacy for retired people in the EU, see the recently published 2015 Pension Adequacy Report. Authors: A. Fulvimari is a socio-economic analyst at the Social Analysis unit of DG EMPL and V. Maestri is an economic analyst at the JRC.